I’m taking a little break during the school holidays. Any orders placed between 9 – 17 April will be shipped on Thursday 18 April. Whether you’re vegan or simply looking to incorporate a few more plant-powered meals into your week, then this is the book for you! Sharon Collins, creator of the popular international food blog ‘Bit of the Good Stuff’ is on a mission to transform the image of healthy eating by showing just how vibrant, flavourful and easy it can be. Sharon’s recipes are a must-have for anyone who wishes to eat well and feel amazing from the inside out. 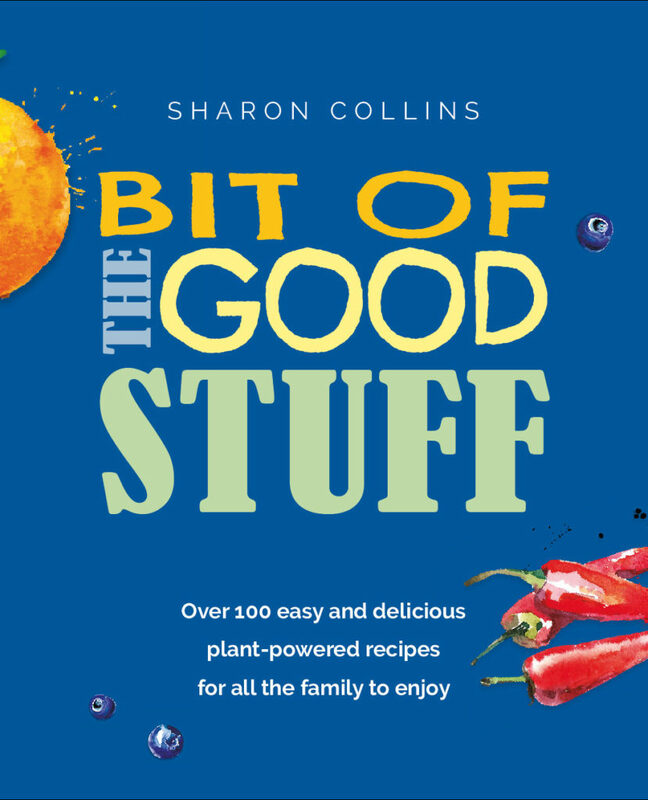 The Bit of the Good Stuff Cookbook has over 100 delicious plant-powered recipes for all the family to enjoy. The book focuses on everyday meals using ingredients that are easy to source. These are the recipes that Sharon’s family eats ‘day in day out’. They are her family’s favourites, all approved and loved by her son (known to her blog readers as Lil’ L). Each recipe has been road-tested hundreds of times by the author, as well as a team of international recipe testers to ensure user-friendliness, easy step-by-step instructions and perfect results. The book has been beautifully designed, and features full colour photographs and watercolour images throughout. It is divided into five recipe chapters (Breakfasts & Elevenses, Soups, Lunches & Light Dinners, Mains, and Desserts, Treats & Snacks) with ingredients stated in both grams and cups. The book also includes lots of practical guidance on eating the plant-powered way. Available in PDF format, which can be opened on any computer or tablet. Amazing book, beautifully written with loads of photos (I can’t stand it when a recipe book doesn’t have many pictures as that’s what tempts you in the first place!) Recipes are gorgeous, easy to follow and nutritious. It’s nice knowing that they are tried and tested extensively by the author and her family. Lots of useful information at the beginning, I especially liked the part about freezer storage, sometimes someone else’s ideas are great at giving you inspiration! All in all a great book, well worth it! Great book; just what I’ve been waiting for! I’m finding these to be really practical recipes for someone (me) who hasn’t got any particular cooking ‘skills’. I’m finding the recipes easy to prepare and the ingredients are easy to find in the supermarket. I think of myself as Whole Food Plant Based and these recipes tick the box. Who knows, I might even try to bake a cake as a bit of a treat; how hard can it be? Great book and great that eating Vegan is being made easy and accessible. My new cookbook has arrived! Just had a very tasty Friendly Green Monster Smoothie after teaching my Love YogaBird class. Delicious! Watercress Soup, Giant Peanut Butter Cups, Overnight Oats, Goji Yogi Surprise, Gourmet Goa Burgers and Caribbean Curry with fried plantain. And that’s just for starters. I love the way this book educates you about nutritional content. There’s a section at the front about ingredients like buckwheat (which doesn’t contain any wheat or gluten surprisingly), cacao powder and nibs, different types of coconut etc, and throughout the book. Well designed, easy to follow and a joy to cook with. I live in Corsham and bought your book at the Chippenham Vegan Fair last week-end. I didn’t get to meet you, but met your lovely son and husband. Just to say I love your recipe book and have already done the burger recipe which went down a treat!! My aim is to try ALL your recipes! What I really like is that all the ingredients are easy to get and can be used across the book. There are no fancy ingredients and everything looks so easy to make. I own a lot of cookery books, some vegetarian or vegan, some not but what I find most of the time is that only a handful of recipes are realistically feasible while the rest are fussy and complicated, requiring obscure ingredients that never get used again. Your recipes look so simple and achievable and this is why I’ve set myself the challenge of trying them all!! It could take a while but I’m happy to keep you posted! So I just wanted to say a massive ‘Well done’ and thank you so much. I’m sure the book will be very successful! I have been following this journey with Sharon for just a little over 5 years. To see her book finally come to print has been a joyous occasion. I was even more impressed when I received the book…oh my word! The recipes are organized so neatly and with delicious pictures. She made sure to include directions for her European audience as well as those here in the U.S. (good to get temperatures and measurements correct). Each of the recipes I have tried have been fantastic…my favorite being the maple granola. The steps are laid out and simple to follow…making recipe success almost a guarantee. I am so pleased with my purchase of this book and I hope that others find as much joy in it as I have. I have recently moved so am finally getting a chance to cook from Sharon’s book. Have cooked the paella, coconut dhal, chocolate porridge, watercress soup and plan to make a few more over the holiday. We have loved the recipes I have made so far and I can’t wait to try more. Great to have recipes for everyday using accessible ingredients. I think it is a great book. I particularly appreciate the excellent index! I get so frustrated by cookery books that have bad indexes. Wanted to send my thanks to Sharon for writing such a brilliant and useful cookbook. The recipes are all within my grasp and look like something all of the family will enjoy. I can’t wait to try them all! I was given your book for my birthday last July by a very dear friend. I’ve had many recipe books over the years, but I can honestly say that yours is quite special … It’s easy to use, interesting, informative and of course – there are some great recipes. And now, I’ve gifted a copy to a friend who has two young children, and she had been telling me how she would like to eat more veggie food but didn’t know where to start. What an opportunity! I’m sure she and her family will have lots of lovely experiences eating food made from your recipes, Sharon.